We are working to improve CHILD SAFETY, HEALTH AND EDUCATION in the communities we serve. We approach our various service projects using Rotary Core Values of Integrity, Service, Fellowship, Diversity and Leadership as our compass. Who We are: CMIRC was chartered as club # 85590 on 21 February 2014. We are group of women and men, from many nationalities, committed to the Rotary guiding principle of “Service Above Self”. Membership is open to all, regardless of gender, religious affiliation, political affiliation, sexual orientation, or nationality. We are a small friendly group dedicated to child safety, health and education through our service projects. With you we can do even more! Social Meeting Night: We are hosting a Social Meeting Night on Tuesday 30 April 2019 from 7:00 p.m. The location will be Dukes Restaurant, Maya Lifestyle Shopping Center, Chiang Mai. For your invitation see any CMIRC member or Contact Us. Meeting Night: Rotary meetings are open to members, visiting Rotarians and invited guests. For your invitation, Contact Us. Our next regular meeting will be 7 May 2019 at Royal Peninsula Hotel. 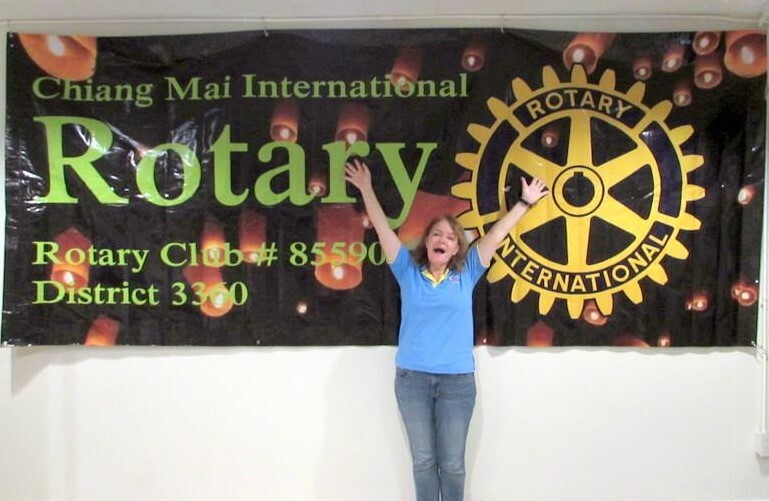 We are the only Rotary club in Northern Thailand that conducts all of its meetings solely in the English language. We began the month faced with yet another move of our meeting location. Our club will no longer meet at the Hong Kong Lucky Restaurant in the Top North Hotel. We will now meet at the Royal Peninsula Hotel on the first and third Tuesdays of every month at 7 pm. Some members will arrive early and have dinner at the hotel restaurant beginning at 5:45 pm. This new meeting facility is by far the best we have had, and we look forward to making the Royal Peninsula Hotel our permanent home! 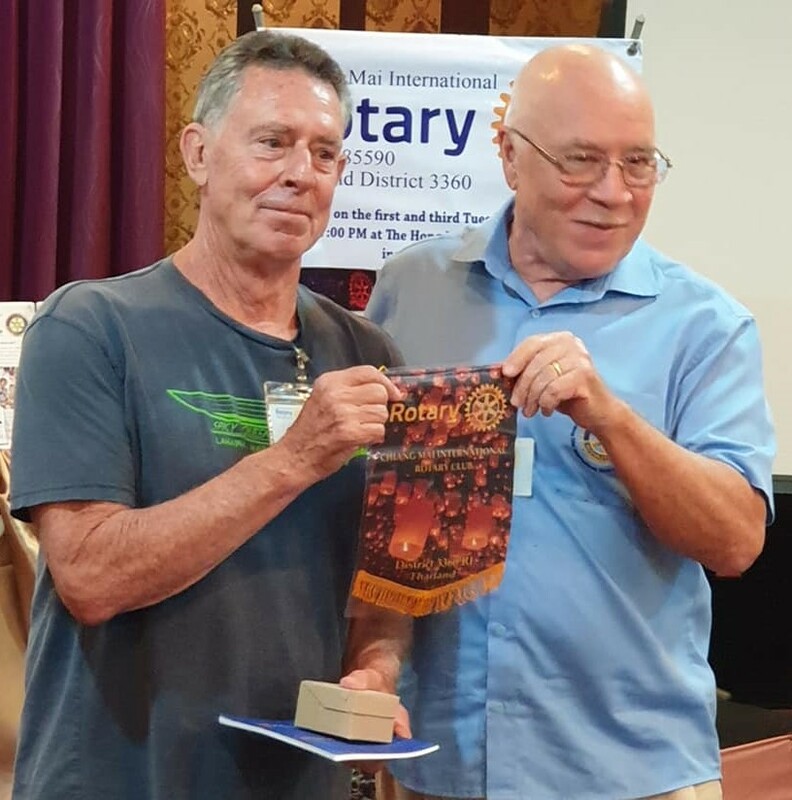 Our first meeting of the month on March 5th was the last at our old facility and featured a presentation by Martin Papworth (pictured right) on his Thailand-based cricket program and how he has used sport to help disadvantaged Thai children. A very interesting presentation, especially for the Americans in the audience. I now know what a “sticky wicket” is!! On March 15, PP Jerry Nelson, PD Clarence Shettlesworth and I met with the grants and development staff at the Mae Tao Clinic in Mae Sot, Tak. We are well on our way to submitting a multi-year Rotary International Foundation Global Grant application for the development of a resource center for migrant learning centers in Tak province. On March 19, we had our first meeting at the Royal Peninsula, it was a happy occasion since we had the newly-elected officers of our CMIRC-sponsored and newly chartered Payap University Rotaract Club visiting. We also welcomed new CMIRC member Gawain Booth (left) to the club. Gawain comes to us from Hawaii by way of Krabi and brings construction and water purity expertise. The meeting ended on a bittersweet note, we recognized PP Shana Kongmun (below) as an honorary member of CMIRC. Shana has taken full-time employment in Bangkok and will be leaving the active-member rolls of CMIRC next month. We wish Shana the best in her new position and hope she can continue to stay involved in some small way with CMIRC as an honorary member. We will miss her! March is also the month when the CMIRC Service Projects Chair and the Treasurer consider and recommend funding for CMIRC service projects and programs for the coming 2019-2020 Rotary Year, which begins on July 1. This year William Churchill and Nancy Lindley have done an excellent job helping project champions develop their plans and build realistic budgets. All the projects approved for next year fall within the club’s signature focus: Child Safety, Health and Education. In all, the club has now budgeted almost 400,000 baht for its service projects and programs next year. Which begs the question, how do we raise these funds? I am happy to announce that Rtn. Andrew Myhill has agreed to take over the Fundraising Committee Chair position, following the amazing work done by PP Shana for the past three years. Please read the project reports in this Bulletin to learn more about how CMIRC has expanded and strengthened its focus on Child Safety, Health, and Education this month. I will end with an appeal. We are getting ready for a very productive 2019-2020 year. Our club’s mission to improve the lives of children in Northern Thailand through our club projects focusing on Child Safety, Health, and Education demands a great deal of effort and commitment from CMIRC members and friends. There is much to do, and if you would like to help us by joining the club, or if you know someone who might like to join, please let me know: john@cmirotary.org or 08 5030 2143 . And, while we have just one regular club meeting this month because of the Songkran holiday, we do have a Social Night at Duke's Restaurant, Maya Mall, Tuesday, April 30 at 7 pm. That's the perfect opportunity for potential new members to come chat with current members over free pizza and learn more about what we do. If you wish to make a financial contribution to the CMIRC, please contact treasurer@cmirotary.org . If you wish to make an in-kind contribution: We especially need children’s toys, sports equipment, and school supplies, please contact president@cmirotary.org or 08 5030 2143. 1st and 3rd Tuesday at 7:00 p.m.